Carrot is undoubtedly one of the most commonly grown vegetables, and one of the tastiest, too. Caring for it from sowing to harvest is easy. Here is how to harvest beautiful carrots. 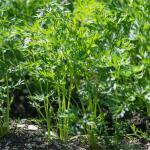 Carrot is usually sown from March to July, even a bit earlier if the climate allows for it. A good practice is to stage the sowing of carrots so that they can be harvested over a longer span of time. To avoid forked carrots, it is necessary to plant in light, loose soil, with neither rocks nor dense clumps. The root of the carrot must be able to shoot straight down without running into anything, if you wish your carrot to grow straight and long. This is the best environment for a carrot to grow well and provide for a great harvest. 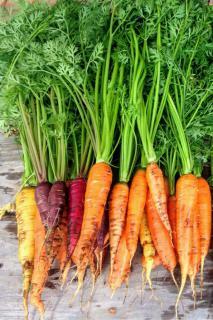 Carrot needs well-drained and healthy soil, in which all rocks and stones have been removed. It hates heavy, clay-laden soil that would stunt its growth. The soil must be loosened deep. Always add river sand when seeding. Carrot needs sun to develop well. If you start in February, protect your seedlings with some type of shelter such as a little greenhouse or a tunnel, to protect them from late frost. Sowing until summer will let your harvest your carrots over the winter. Choose a place in your garden with a protective tunnel or cold frame during the first few weeks. Cold protections can be removed towards the end of March or beginning of April. Dig furrows 20 inches (30 cm) apart and sow in a straight line. Thinning means removing the weaker and more fragile sprouts, to make room for the more vigorous ones. 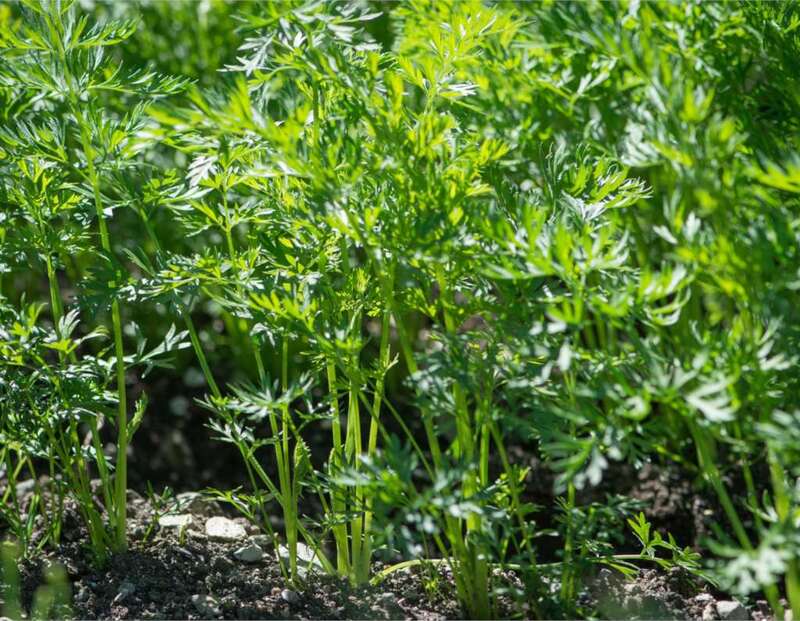 This step is crucial to select the nicest plants and to enhance future carrot harvests. As soon as the first leaves appear, thin down to 3 to 4 inches (8 to 10 cm) between sprouts, keeping the healthiest ones. Thin again as growth continues, to ensure that there is always breathing space between the crowns of leaves so that they don’t compete. Always keep the healthiest of two competing plants. You can keep your carrots in the ground, and pull them out when you need them – even over winter! 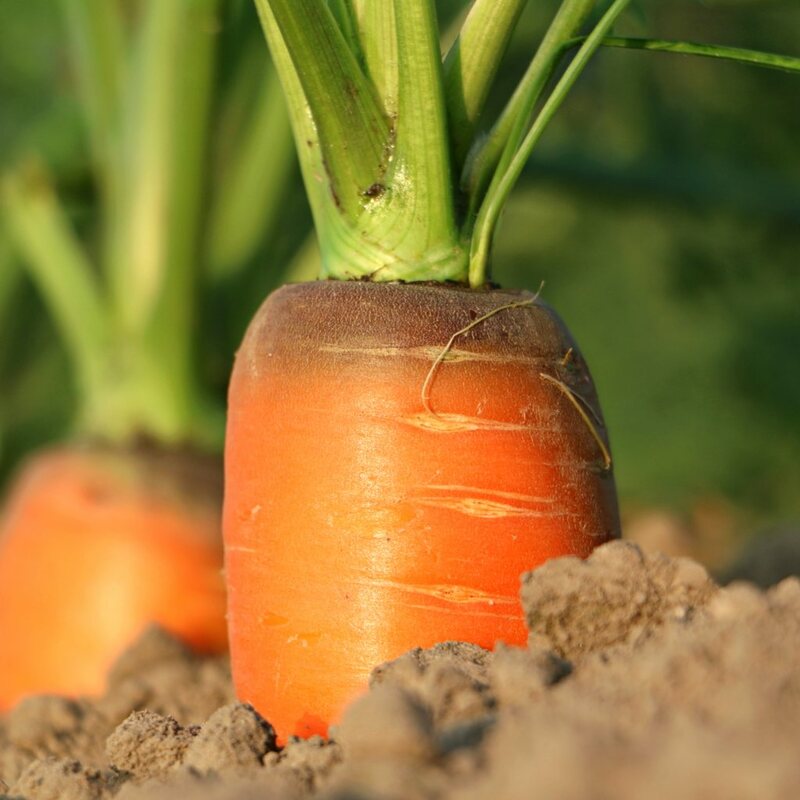 Caring for each carrot helps boost its growth and maximize your harvest. It is best to add fertilizer to the soil before planting your carrots. Use dried manure or organic vegetable patch fertilizer. Avoid mixing fresh manure into the soil just before sowing, since this could burn your young seedlings. 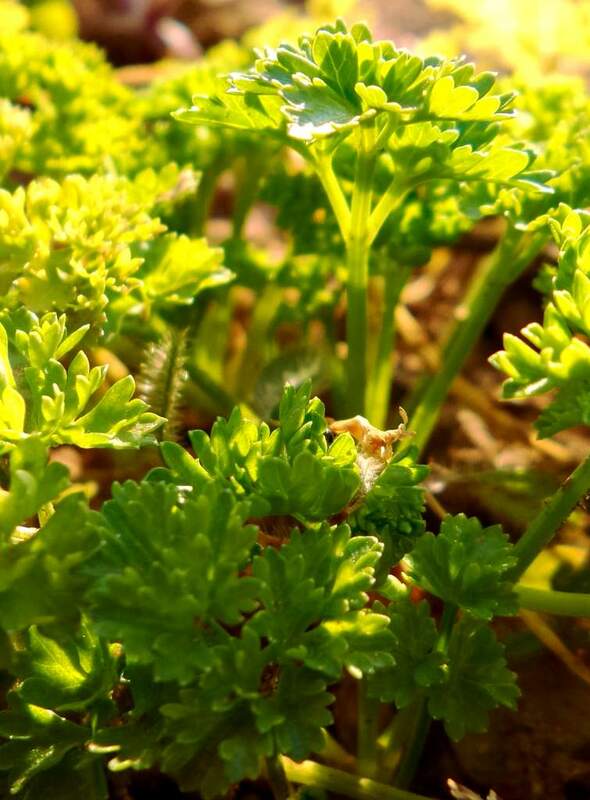 Finally, to avoid watering too often over the whole season, mulch around your carrot stems. This will reduce evaporation and serve to control weed growth. Running the hoe along the rows regularly also helps control weed growth and ensures that water continues to drain well. A carrot is ready for harvest around 3 to 6 months after sowing, depending on the variety. Early varieties sown under some type of protective cover can be harvested less than 3 months after sowing. Summer varieties usually need 3 to 4 months until they are ready for harvest. Late winter varieties grow slowly and require up to 6 months before becoming harvestable. To harvest a carrot, you simply need to carefully pull it out entirely with its leaves, without damaging neighboring plants. This can be done comfortably and carefully if you use a spading fork while pulling the carrot out. In some soils, it helps to press the carrot down into the ground before pulling it up. This breaks tiny rootlets off. Once they have been harvested, let them dry in the sun for a couple hours for easy removal of dirt. To keep carrots as long as possible during winter, place them in a cool, dry, ventilated spot that never freezes. The best way to keep them is in a crate filled with dry sand. There are a great number of carrot species for sale, many of them F1 hybrids. There are over 510 types of carrots cultivated throughout the world. ‘De la Halle’ – very productive open field variety, sown from March to May. ‘De Saint-Valery’ – productive, hardy, sown from July to November. ‘Tilques Giant’ – very long, hardy, sown from July to November. ‘Nanco’ – one of the best F1 hybrids, sown from February to March. ‘Nandor’ – long and thin root, sown from March to May. ‘Nantaise’ – quite the ordinary one, but delicious, sown from March to May. ‘Solist’ – very tasty, mixed use, easy to grow, sown from April to June. ‘Suko’ – very tasty, mixed use, easy to grow, sown from February to March. ‘Bellot’ – early carrot with a short root. 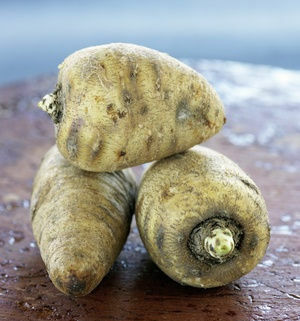 ‘Tip-Top’ – with very long roots, keeps very well. ‘F1 Balin’ – beautiful hybrid variety with sweet round roots. ‘Touchon’ – with firm flesh, for the earliest sowing. ‘F1 Ascania’ – for late season, keeps very well. Carrot is a biennial vegetable that belongs to the Apiaceae family. It’s possible to grow carrot in virtually any climate, and it can be harvested from June to November if you plant different varieties. It is common knowledge that carrots boast high levels of vitamins A and C, as well as carotene. It can be savored both cooked and raw, and this helps intestinal transit. Finally, although this plant is truly a perennial, in our colder climates it is grown as an annual. A carrot contains high levels of carotene, which is a nutrient that makes your skin glow if you make it part of your diet!